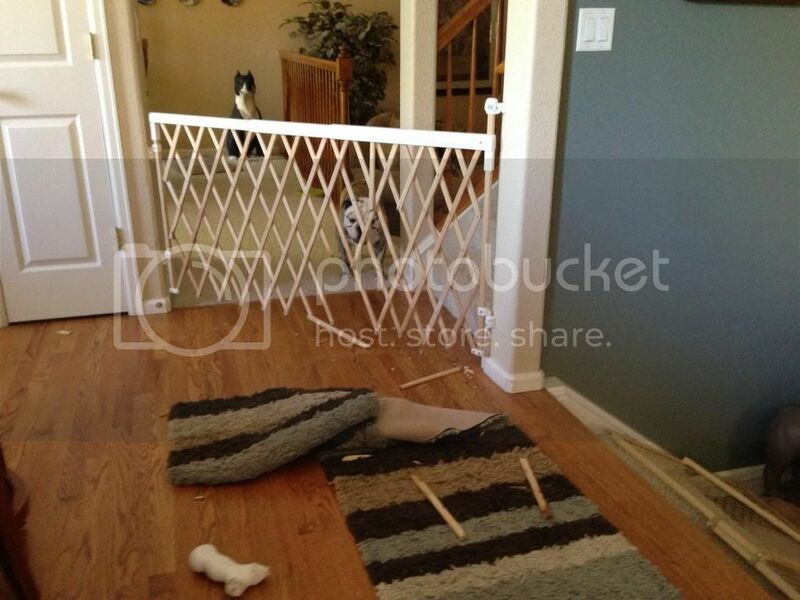 Not sure which one did it but someone chewed the new doggie gate today. In the kitchen we have Wilson & Emma. In the rest of the house we have Jack. In the crate we have Sally. Today, Sally got to stay out for her very first time with Wilson & Emma in the kitchen. Check the cameras at 4ish, all's good. Check the cameras at 4:45 and notice the gate to the family room is down (instantly think of Houdini Emma when she had her great escape). Walk into the house and then see this one destroyed. Thinking to myself whodunit now? There's Jack, he's a good boy really and no way would he dare. Think of Sally, well she doesn't have barely any teeth so unless she GUMMED it, it wasn't her and she's an anyway and can do no wrong. That leaves Emma & Wilson, they're both crazy . Emma........NOT A CHEWER! Process of elimination and that leaves WILSON and he's a wood chewer. 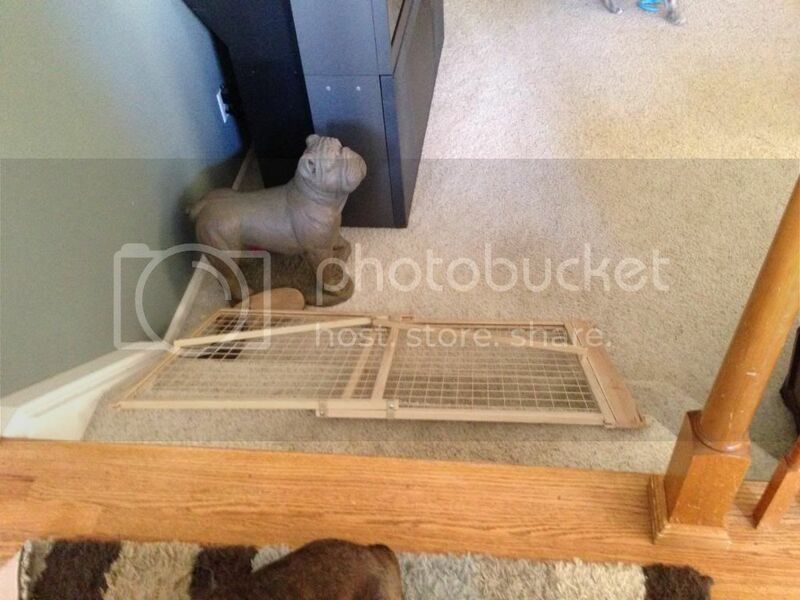 Go to Babies R Us tonight to get another gate, find a new one that's metal and is is 65" - SCORE!!! Go to put it together tonight and it's a fixed setting. Dang it won't work, we need an expandable. Back to Babies R Us tomorrow to take it back. Oh and Sally left me a horse sized chit in the kitchen but she didn't potty. Well if you ask me…and keeping in mind you didn't, but I'm going to put my .02 ¢ents in anyway, some stray road trash, broke into your house, and tried to convince sweet Mustang Sally to run off and elope with him, as she was saying no, my mommy needs me here, Emma and wilson tried to fend him off, as he was trying to break them out of jail, Wilson ended up beating him up and putting him out the house after he ch*tted on the floor with the horse sized dung, and he was gone before you got home, but if it hadn't been for Emma, Wilson, he would have kidnapped that pretty sweet little Mustang Sally from your home and eloped with her…… Emma, Wilson and Sally should receive snacks for fending for Sally, and Sally a Snack for saying no, and every dog in the neighborhood given the stink eye until we find the worthless bum that tried his best to get these angels in trouble, and had the audacity to leave a horse size dung on the kitchen floor…… I think if I were you, I would bag the Ch*t in a sandwich bag, and take it to the police department, and file a report, ask them to analyze it for DNA, and lets hunt the Villan down !! Now that's my vote !! Well, don't be too hard on Wilson, he looks like a good boy. It must be hard to have naughty bullies. We have fairly good luck with our sweeties. Arnold is a good boy most of the time, considering he still has all his man parts, and my Bertha, well, lets just say she is perfect and has never done a thing wrong. Oh, poor Wilson, he gets the blame...again!!! That sweet boy. I really doubt he did it...I think it was that bulldog posing as a "statue" that is the true culprit! I dont know how you missed it, but it had to be a defective gate when you put it up. I'm sure there were no hooligans involved in this gate problem, and you certainly can't blame an angel. Yep, I'm going with defective gate. You should get your money back! Lol. You should be a writer, your stories are hilarious, thanks for the chuckle. Jeannie stop blaming poor Wilson, it was probably that stray cat again. It's too early for me to have a witty response your thoughts so I'll just do this!! !